Winner of Guitar Magazine’s ‘Guitarist Of The Year’ award in 1991, Dave Kilminster is a skilled player who has been performing with Roger Water’s ‘The Wall’ touring show recently. Credited by Keith Emerson as an inspiration to get back on the road, Dave now has released his debut solo album ‘Scarlet’. Taking the roles of guitarist, lead vocalist, keyboard player, co-producer and song writer, Dave is backed by Pete Riley on drums and Phil Williams on bass. 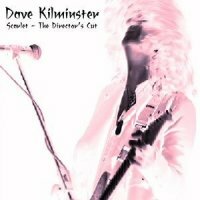 His opening track ‘Silent Scream’ is a funky start with a confident vocal from Kilminster, its staccato guitar parts providing suitable underpinning to Dave’s voice. ‘Static’ also features a funky feel with a rock undercurrent before things take a step back with the acoustic ‘Just Crazy’. This excellent ballad is a highlight of the album, as is ‘Angel’ which features a great introduction by a string quartet. Dave sings this one particularly well and it’s one of my favourites on the record. ‘Chance’ is driven by a jazzy guitar part which reminds me of some Richie Kotzen’s experiments in the genre, before the rocky ‘Big Blue’ showcases some of Dave’s guitar pyrotechnics. The best rocker on the record is ‘Liar’ with a great chorus, which precedes the almost ten minute long ‘Rain… On Another Planet’ featuring some impressive guitar soloing in the outro. The album is a mixed bag, dipping its toes in the water of several genres. For a first album though, it only goes to highlight Dave’s versatility and talent. One to watch!